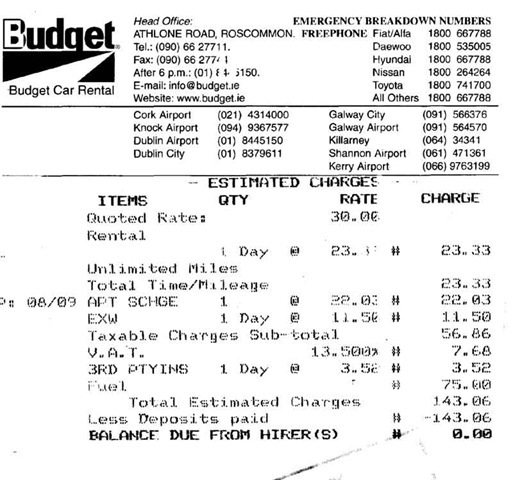 Last June, Peter Donegan wrote a piece about Budget Car Hire. Price includes all compulsory Insurances, Government Tax, Unlimited Mileage and 24hr Breakdown cover. Please take a moment to read the Terms & Conditions of rental before making your booking. He thought that was a reasonable offer, and availed of it. He hired the car one morning in Cork, and returned it that evening. Now, just take a look at the Total Estimated Charges. €143.06. Yes. That is One Hundred and Forty Three Euro. Not bad for a hire that is advertised at a mere €34? Naturally, Peter queried this, as anyone in their right mind would. He also got in touch with the Car Rental Council of Ireland, the National Consumer Agency and Fáilte Ireland, amongst others. They had advertised a rental at €34, but the “small print” had brought the estimate up to €143.06. All of this went on last June and July, which is seven months ago. In the world of the Interweb, seven months is a very long time. So why is he now receiving threatening phone calls? Why is “a legal office” demanding that he remove a seven month old post within 48 hours? If this “legal office” is indeed representing Budget Car Rental, then why are they suddenly moving with such urgency? It’s hardly as if the post is documentary evidence? It’s not even as if Peter had written anything libellous. If he claimed that Budget Car Rental were committing fraud, or that Budget Car Rental were deliberately conning people, then they might have a case against him, but he didn’t. He simply stated the facts. There is something very fishy going on here. I would love to hear real legal opinion as to the legality of his post. 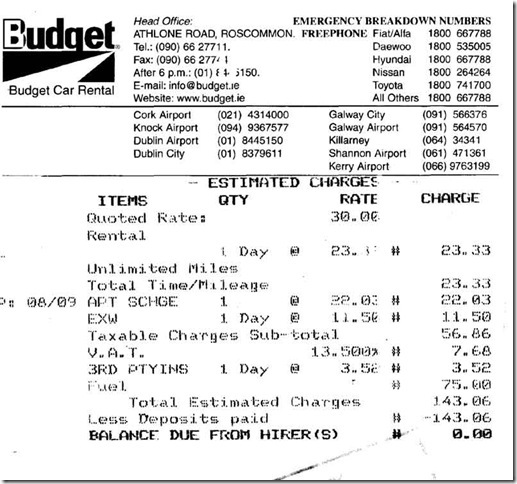 I now hear from my very reliable sources that the ‘legal office’ is, indeed acting on behalf of Budget Car Rental. Budget Car Rental deny any hand act or part in it and are anxious to find out who this ‘legal office’ actually is! Thats madness, I hope he gets it sorted. Brianf – I think that might be a good idea. There is something very strange going on. Val – The more I hear about it, the less I think Peter has anything to worry about. Just typical legal posturing. If he’s telling the truth there’s little anyone can do about it. Sounds like someone spruiking for Budget’s business. Still, he should have read the fine print. As long as everything he is posting is the truth then their is nothing anyone can do. Truth is the perfect libel defense. The simple fact that he couldn’t figure what the final charges were for his rental speaks volumes about budgets practices. Although a lawyer may try and twist the amount he claims and the actual amount as an attempt to defame Budget I doubt they will try anything. Considering the updated amounts and all the communications are in his blog. I see him as in the free and clear. He should find out if it is Budget who hired this legal office though. Not a lawyer just well versed in bending the law. Baino -I agree about the small print, but for the latter to quadruple the price? I would still call that misleading advertising. Dean S – Welcome! The strange thing is that Budget hotly deny that they employed anyone to phone Peter, yet the ‘legal office’ claim they are acting on behalf of Budget. Someone’s wires are very twisted? I had a call with him and it seems to me that for a wind-up/prank someone would have had to have gone to an awful lot of trouble. Sounds to me like that some in the legal office is pulling a “deniability” clause to make this all go away. If this is the same Budget Rental we have here in the States there’s little difference to be seen. They’ll advertise $29.00 per day for car rental and in the end you get charged around $75.00 after all is said and done. Been that way for a long time now. Same for most other major car rental places that I’ve seen. I read Peter’s posts, both original and follow-up and it occurs to me that Budget wouldn’t give two shits about Peter’s car-hire post especially in light of the fact that nothing in his original post suggests slander against Budget Rental, merely the truth of the matter, which cannot be held against him. They’ve got business to attend to and I’m seriously doubt that they’d even consider looking for blog posts concerning their company. The so-called “legal office” is no more than a bunch of low life’s with nothing better to do IMHO. This situation says more about the wiggle-room allowed by current legislation in the UK and ROI when it comes to trade descriptions, than it does about one company’s attitude to public criticism. Budget and every other retail organisation that uses tactics like “Up to 8MB” (BT – Bastards!) and “up to 50%” off to rip the arse out of peoples’ wallets should be prosecuted. I do think there is a case for having a section in a national newspaper of record where consumer protection organisations can name and shame companies trying to effectively hoodwink people. I can’t recall the name of the publication but if some person runs up debts and can’t or won’t pay them their name can be put in the paper so companies can effectively ‘blacklist’ them. I don’t see why a ‘Sharp Practice’ section shouldn’t be published by the Times or Independent or both preferaby. I know lawyers will shake their heads at such a suggestion but there is no reason why a lawyer can’t check the facts before publication. That is the very function of newspapers in a democracy- and the people I worry about the most (old people not up on the latest fly schemes) won’t have their money taken from them and be left upset and feeling foolish. Its just not right. Here’s the best bit though- in Ireland there is an organisation called the Office for Corporate Malpractice or something. They are lying down very quietly in the grass still picking up wages no doubt even though no man can say corporate practice in Ireland or anywhere else has been anything other than shady in the last ten years. You only have to look at people like Sean Fitzpatrick to see that. And there’s a long list of people who regard themselves as clever for effectively being nothing more than a cheap shyster in a suit bought with other peoples’ earnings.